A 39-year-old man was sentenced Monday to 10 days in jail for injuring his wife in a domestic disturbance last May in the southern arm of Blaine County near Minidoka. In accordance with a plea agreement, Charles Lester Strate pleaded guilty to misdemeanor domestic battery at a hearing in Blaine County 5th District Court. He had been charged with felony domestic battery. "You might have been convicted of a felony," Judge Robert J. Elgee said. "The fact that it's a misdemeanor doesn't lessen the seriousness at all." Strate's sentence could have been worse. Misdemeanor domestic battery in Idaho is punishable by up to six months in jail, and the Blaine County Prosecuting Attorney's Office recommended 30 days behind bars. In accord with the agreement, two other misdemeanor charges—exhibition of a deadly weapon and "intentional destruction of a telecommunications instrument"—were dismissed. The charges against Strate date back to May 22 when Strate and his wife got into an argument at their home about six miles east of Minidoka. A probable-cause affidavit filed by the Blaine County Sheriff's Office states that Strate pushed his wife, causing her to fall and hit her head on a toilet, fired a gun into the floor of the home and broke his wife's cell phone when she tried to call for help. Strate said during Monday's hearing that he was intoxicated at the time of the incident but he has since quit drinking. "I'd like to say that our family has gotten stronger since this incident," he told the judge. Strate's wife gave a "victim's statement," asking the judge not to put her husband in jail, and testifying that the couple's relationship has greatly improved since the incident. "Things have been going great," the woman said. "Basically, he's been a good husband and father. Putting him in jail would hurt us more than anything. We'd lose our home, he'd lose his job, it wouldn't do us any good." Elgee ruled that Strate can spend his jail time on five consecutive weekends, starting on Jan. 14, so that it won't affect his employment. 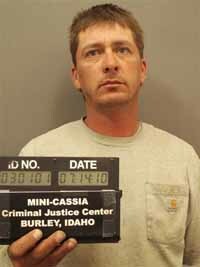 He also allowed Strate to serve his time at the Mini-Cassia Criminal Justice Center in Burley. Strate was given credit for one day already spent behind bars. Strate was also placed on probation for two years and ordered to undergo alcohol abuse counseling.